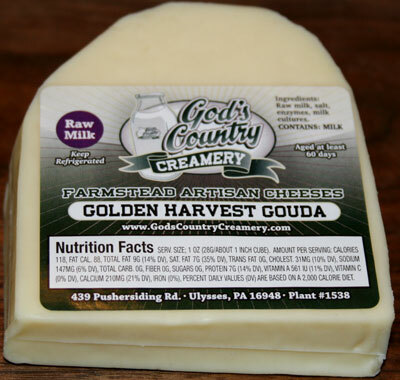 Our Gouda has a melt-in-your-mouth, buttery texture and a pleasantly mellow flavor. This mild cheese expresses a subtle nuttiness leaving a suggestion of cedar undertones. 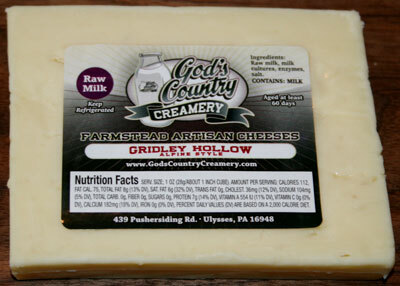 The creamery's Gouda is aged about two months to bring out these amazing natural flavors. To keep the cheese as natural as possible, the cheese is not smoked and no coloring is added. Melting our Gouda, showcases the cheese's collage of flavor and adds interest to any dish including a breakfast sandwich, mac and cheese, or panini. After taking a few bites of this cheese, you'll feel like you're lounging in the Ludington Valley hills on a sun-filled autumn day. 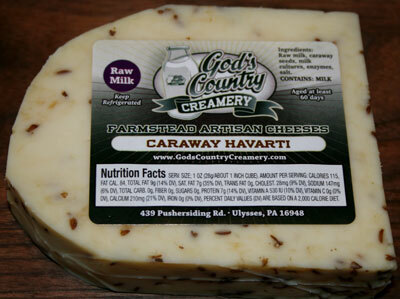 This cheese blends the divine flavor of caraway seeds with our Heavenly Havarti cheese. Not only does this cheese provide a delightful treat for your mouth, it adds beauty and interest to any cheese plate. A stark contrast to the mild mannered Heavenly Havarti, Hellish Havartis guarentees to awaken your taste buds with both habanero and chipotle peppers. Just as every piece of handmade lace is unique, no two wheels of Ludington Lace are the same. The aging process creates randomly placed holes in this lovely alpine treat. Its flavor is that of a very refined Swiss cheese. 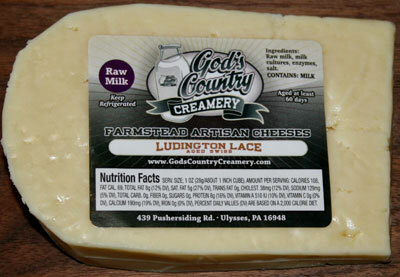 Though not as strong as the Gruyere, the Ludington Lace does have a sweet and traditional "swissy" flavor to it. Our Gouda now has a dark side! 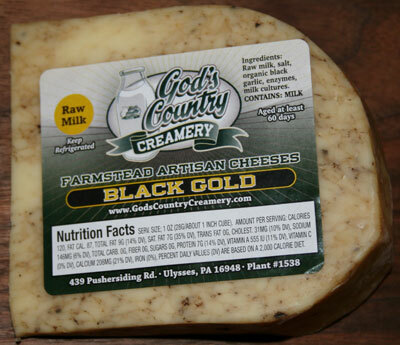 With flakes of organic black garlic from our friends at Obis One and a black garlic ash rub, this cheese is sure to keep the vampires at bay. This unique cheese variety has both savory and sweet flavor components that meld nicely with the smooth texture and creamy taste of our gouda. If you are looking for a conversation starter and crowd pleaser, this one-of-kind cheese is the cheese for you! 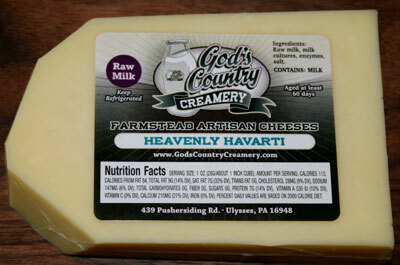 Havarti's distinction is its creaminess and sweetness that leaves a slightly sharp flavor. Here at the creamery, we find this to be the most pleasant of all the cheeses. Further adding to its special appeal, are the tiny crevices created in the cheese during the pressing stage. As its name suggests, this semisoft cheese is a friendly snacking cheese full of angelic flavor. 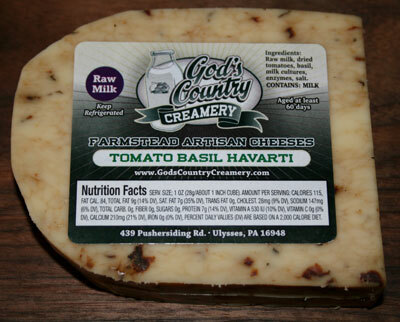 This cheese blends the harmonious flavors of sun dried tomatoes and basil with our Heavenly Havarti. This variety is a real crowd pleaser! This cheese exhibits rich, nutty flavors that gently ease into subtle citrus undertones. The sweet spring water and lush green pastures on the Bachman farm help give the cows' milk just the right amount of sweetness to produce the perfect flavor in this variety of aged alpine cheese. 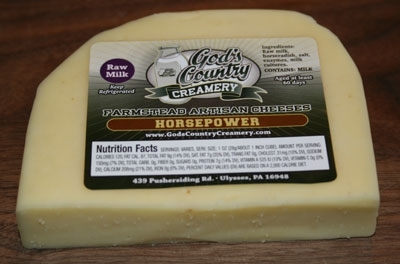 To ensure that every wheel of Gruyere tastes especially delicious, God's Country Creamery ages its Gruyere longer than all the other varieties of cheese. Horseradish powers up our Colby-style cheese in the Newfield Junction. The perfect firmer texture of the Newfield Junction joins with the bite of horseradish to produce a standout snacking experience. Grab your pretzels, pickles, beer, and crackers, and enjoy Horsepower at your next gathering. 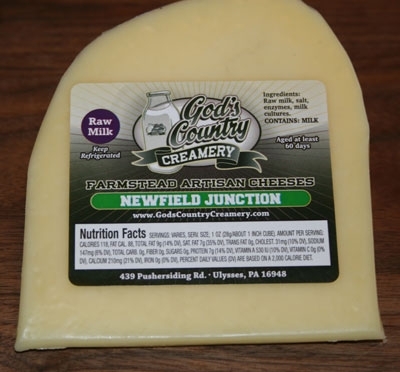 New to the line up of our cheeses is Newfield Junction. Smooth, slightly firmer texture resembling a Colby-style, this cheese will be a snacking cheese that will always leave you wanting one more piece. It has a mellow flavor with a touch of tangy sharpness that will be perfect for, well, just about everything. The name is familiar to the locals, and you may even see it on a road sign as you are driving to our place! 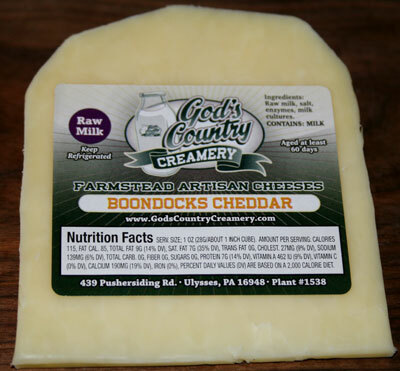 Our tasty cheddar has a rich, earthy flavor that captures your senses and brings your imagination to the wide-open spaces of Potter County. As the cheese ages, the mild yet pleasing flavor deepens into a 'can't-stop-snacking' cheese. While this cheddar is full of flavor, you'll be sure to enjoy each bite free from bitterness. ~Fresher and softer than pre-cut cheese trays. ~Pick from our delicious selection of cheeses to build a tray unique to your needs. ~Design a tray for every occasion. ~The trays come in two sizes: The large serves 30-40 people and the small serves 15-20. Please go here to order our cheese tray kits!